This new version of the Lily from Mulberry is a much larger version and is made from soft grained lambskin leather in midnight, which is navy blue. The bag also doubles as an oversized clutch. All the metalwork on the bag is gunmetal in colour, including the postman’s turnlock fastening on the front of the bag, the horse shoe charm contained in the hanging leather fob, and the chain strap, which features for the first time a trompe l’Oeil (trick of the eye) buckle on the strap. 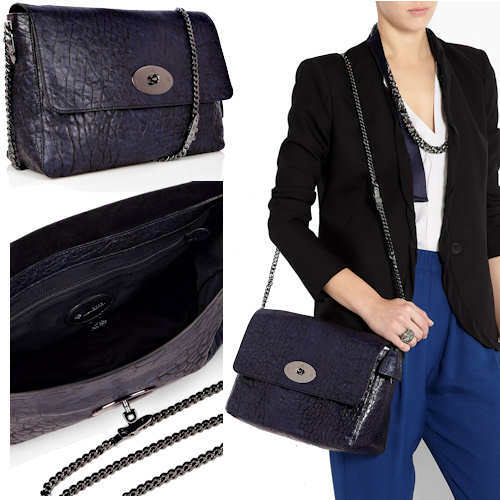 The chain enables the bag to be worn over the shoulder, or it can be pulled through to wear the bag cross body. The bag is lined in brushed leather and there is one zip pocket with an oval Mulberry label and metal fob. Style note: This larger version of the Mulberry Lily makes the transition from daywear to nightwear with style. It’s big enough to carry the essentials and more and the cute trompe l’Oeil buckles on the chain are a nice touch. Expect to see on the arms of a celebrity very shortly.